GALION — There was a common theme at Wednesday’s candidate’s night event at AA American Bail Bonds. Candidates who chose not to attend a community forum at Galion Community Theatre organized their own informal get-together Wednesday included Durbin, mayoral candidate Jim Hedges, city treasurer candidate E. Roberta Wade and Joe Haley, who is running to represent the city’s 3rd Ward on city council. Hedges owns Memory Lane Auto Museum in Galion. He says if elected he will “regain control of city finances, lower utility rates, encourage job growth and investment and fight back against opiate addiction and drug-related crimes. He also said he will lead a community-wide strategic planning effort. Hedges, Wade and Durbin talked about things they see as being done incorrectly when it comes to running the city of Galion. They all stressed a need to get out of fiscal emergency. Hedges also wants to bring industry to town and says as mayor, he’ll do what he needs to do in order to accomplish that goal. Durbin has 12 years of city government experience and was Galion’s treasurer from May 2013 to December 2015. She said legislation is not always as inclusive as it should be. Durbin also says department heads in Galion should be responsible for their budgets. Not just the amount of money available to spend, but they must be more accountable for every cent their department’s spend. Her platform states something the other candidates echoed Wednesday. Wade is a licensed attorney with a degree from Ohio State that focuses on health care and health insurance. She was Galion’s city auditor from 1982-85 and twice served on city council (1980-81, and 2006-13). She was Galion’s director of law in 2013. She said there are specific areas where Galion can do better. One problem is the high cost of health care. Wade said city council must be more cognizant of where funds they agree to spend is actually going and why. She’s also unhappy with the current proposed utility rate hike. Wade said her experience and expertise in health care and utility legislation can benefit Galionites. Haley, is running against Mike Richert to represent the city’s 3rd Ward. He admitted he’s not a politician but is unhappy with the high cost of taxes in Galion and what he perceives as wasteful spending by the current administration. He agreed with others in attendance who said the east side of Galion is often forgotten when it comes to city spending. While he agreed that the splash park facility at East Park is nice, it is not a swimming pool, which is something area residents would like to have. Recent spending on improvements at Heise Park was mentioned by the candidates and compared to spending at East Park, South Park and the reservoirs. Haley has gone door-to-door making his case for election. He said he was surprised by one answer that many he visited gave. 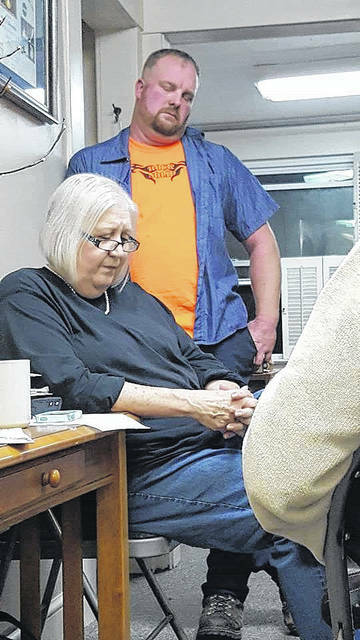 Galion auditor candidate Paula Durbin and Joe Haley, who is running for the city’s 3rd Ward council seat, took part in an informal get-together Wednesday night to talk about politics at AA American Bail Bonds.